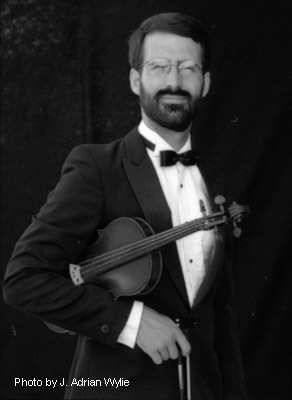 Nathan Peters received his Bachelor's Degree in violin performance in 1992 and his Master's Degree in viola performance in 1993 from the University of Michigan. His teachers were Paul Kantor and Yizhak Schotten. As a fellowship student, he performed at the Aspen Music Festival in 1993 and 1994. He has performed in many symphony orchestras and chamber ensembles including the Ann Arbor Symphony, Toledo Symphony, Metropolitan Opera Orchestra of Detroit, Flint Symphony, Lansing Symphony, and Round Top Festival Orchestra. Nathan is coordinator of the annual MASTA chamber music festival and competition for students of Michigan and host for MSBOA's annual string clinics. He has worked at the Blue Lake Fine Arts Camp and Superior String Alliance camps as a violin and viola instructor. He is currently in his 18th year of teaching orchestra classes in the Chelsea Public Schools. He teaches violin and viola students in Chelsea and Ann Arbor, MI.